Shopping malls are constantly looking for ways to attract foot falls, satisfy their tenants and advertisers and be seen as a leading edge modern retail shopping destination. While all modern shopping malls have deployed digital signage screens, touch kiosks at strategic locations across their property, one of the latest trend is to deploy a large indoor video wall at their entrance area or atrium to create a wow factor for their visitors. Video walls are created by putting together multiple thin bezel screens tiled together continuously or overlapped in order to form one large screen which can show different content or content that stretches across screens. 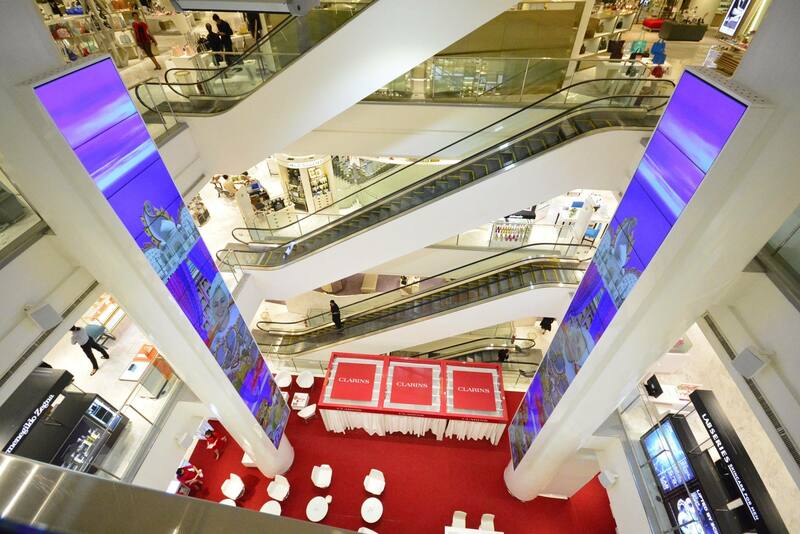 Ryarc CampaignManager is used by leading shopping mall chains to not only manage their digital signage screens and audio but to also drive content on their large video wall installations. CampaignManager provides enterprise level features for remote management, publishing, monitoring, logging, proof of play and versatile playback capabilities for all standard media formats be it images, flash animation, regular and HD videos, live web content, RSS tickers, xml feeds, in a seamless channel. Combining a user friendly interface with unparalleled scheduling power, security and flexibility, CampaignManager is a tried and tested solution for managing a standalone video wall installation or thousands of digital signage screens, audio and video walls across different locations.